Take me out to the ballgame! The harbinger of spring -- Punxsutawney Phil notwithstanding – is a little more than a month away and not unexpectedly, catching your favorite team for its first game of the season will cost a pretty penny in many of the bigger, more popular markets. The defending World Series champion Houston Astros, who open at home against the Baltimore Orioles on April 2, are playing in two of the top five most expensive Opening Day games, according to data from TicketIQ.com. 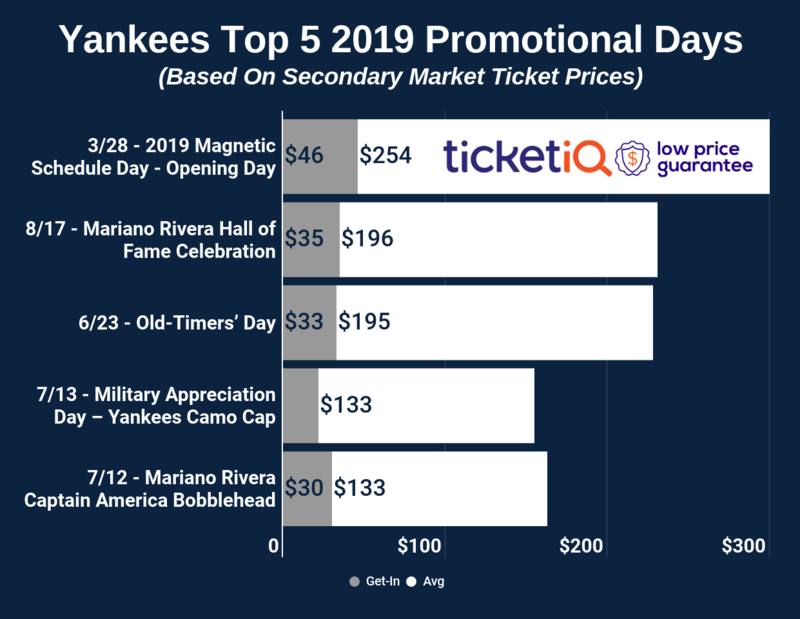 The average asking price for a ticket to that game on the secondary market is currently $323 – the second highest price of any Opening Day across Major League Baseball. The Astros’ 2018 season opens at cross-state rival Texas on March 29 and that ticket is the third-most expensive at $289. The Astros will raise their World Series banner on Opening Day. To put the cost of an Astros’ home-opener ticket in perspective, TicketIQ.com reported earlier this year that it is the second-most expensive Opening Day ticket for a World Series winner that the company has tracked since 2011. Only the Red Sox 2014 opener, at $395, was more expensive. The Los Angeles Dodgers, who fell to Houston in the World Series, aren’t even in the top five in terms of price for Opening Day. The current asking price for their March 29 game against the rival San Francisco Giants is $262, the sixth-most expensive ticket. 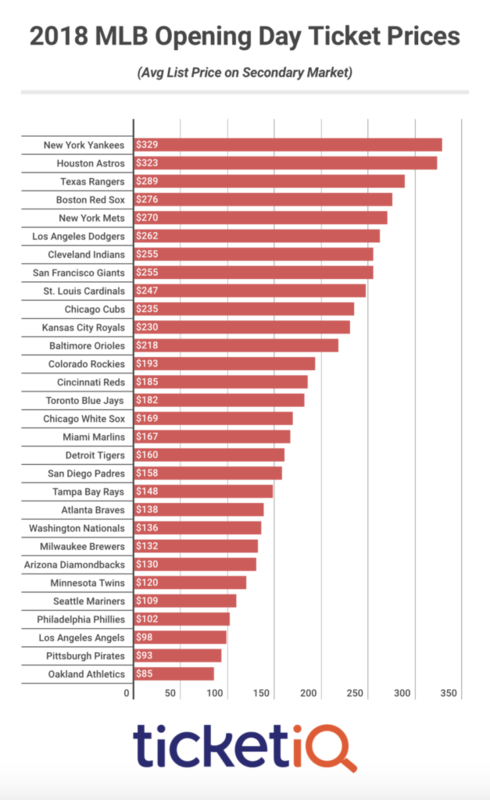 Four of the top five priciest tickets are in the American League. Besides the Astros and Rangers, the New York Yankees, who open at home against the Tampa Bay Rays on April 2, come in at No. 1, with a price of $329. After the Rangers game, fans will pay an average of $276 to see the Boston Red Sox open against the Rays on April 5, making it the fourth-most expensive ticket. The New York Mets are the only National League team in the top five in Opening Day prices – fetching $270 when they host the St. Louis Cardinals on March 29. There are some Opening Day deals to be had across the country – and there will be nowhere cheaper than Oakland, with an average asking price of $85 for the team’s home opener against the Angels on March 29. Only two other teams currently have a sub-$100 ticket average – the Pittsburgh Pirates ($93), who host the Minnesota Twins on April 2 and the Angels ($98), who host the Cleveland Indians on April 2. The next two least expensive Opening Days are set for Philadelphia, where fans will pay an average of $102 to see the Phillies play host to Derek Jeter’s Florida Marlins on April 5, and Seattle, where fans can expect to pay about $109 to see the Mariners play host to the Cleveland Indians on March 29. But if you want a deal of the century, you’ll find that Miller Park. The current get-in price for the Milwaukee Brewers home opener is just a tad more than a coffee drink -- $6 to see team host the Cardinals on April 2. That is the only single-digit-priced ticket in all of baseball, though the get-in price for two games is $20 (the Twins home opener on April 5 and that A’s game).